NYX is a highly raved about brand and with it becoming readily available in the UK this year I was so excited to get my hands on some products. First up I won a competition a while back with Feel Unique where I received the matte finish long lasting setting spray. I have to admit I'm not normally one for a matte finish as it doesn't normally work well with my dry skin but I've been really enjoying using this. My makeup has lasted all day without drying out my skin, I'll be trying out the dewy version when this bottle runs out. Next up is the liquid illuminator in the shade sunbeam. A little bit goes a long way with this product, I use it in replacement of a highlighter for days when I want a more subtle look and under my eyes to brighten. Its also very lightweight and lasts all day. After reading so many rave reviews about the soft matte lip creams I knew I had to give them a try! I picked up London which is a peachy brown shade and cannes which is a warm pinky shade. I love the texture of these lip stains they go on silky smooth and dry quite quickly. I wouldnt say they are the longest lasting lip stains I've used but do last around 4 hours before needing to be re applied. Lastly I picked up an NYX lingerie lip stain in the shade bedtime flirt which to me is a mauvey- pinky tone and is described by NYX as a rosy cinnamon shade. These are super easy to apply and dries on the lips very quickly without completely drying them out. I definitely want to pick up more shades from this range. 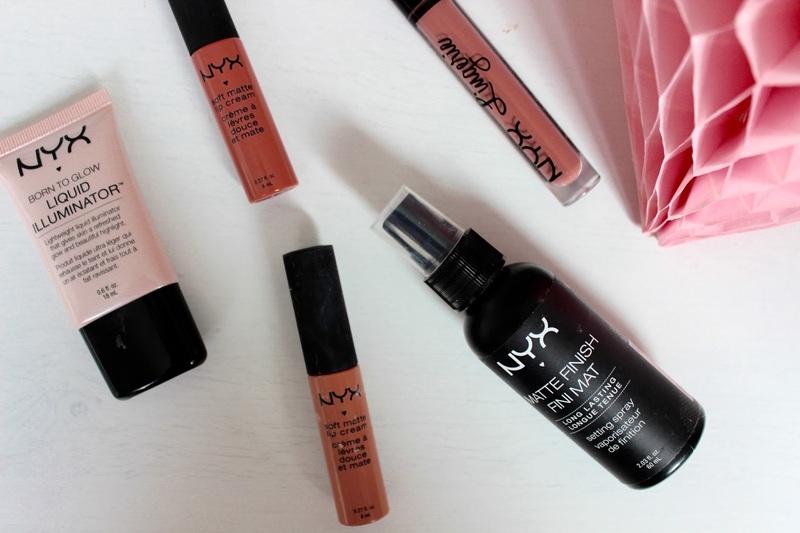 Overall I love everything that I've tried from NYX I think their quality is good and their prices are very reasonable, I can't wait to try more from the brand. I want to try out some of there lingerie shades too! I have Cannes and I love it so much, it's perfect all year round. I'd be interested in trying the setting spray. I'm really hoping my local boots stocks this when I pay a visit tomorrow!